The national flag of Malta with the George Cross in the top-left-hand corner. Malta is a tiny country and island in southern Europe. It's the smallest European Union country in size and population. The country is located in the Mediterranean Sea between Sicily, Italy and Tunisia. Its capital city is Valletta. Malta has been a member of the European Union since 2004 and uses the Euro as its currency. People have lived in Malta for over 7000 years. The original inhabitants were farmers and hunters who came across the water from Sicily. Ancient temples built by these first settlers remain on the islands today. Over the centuries Malta was occupied by the Greeks, Romans, Arabs, Sicilians, Normans, French, British and other empires and civilizations. In 1814 Malta became a part of the British Empire. The cross on Malta's flag comes from the George Cross which was given by Britain to Malta for bravery during World War II. Malta gained independence in 1964 and is currently a member of the Commonwealth of Nations, as well as the European Union which it joined in 2004. Malta is an archipelago in the Mediterranean Sea about 93km south of Sicily, 250km north-east of Tunisia and 300km north of Libya. The three largest islands are Malta Island (Malta), Gozo (Għawdex), and Comino (Kemmuna) and these are the only islands on which people live. The climate is Mediterranean, with mild, rainy winters and hot, dry summers. There are only two seasons, which makes the islands attractive for tourists, especially during the drier months. However, strong winds can make Malta feel cold during the springtime. The islands are mostly flat - the highest point is only 253 metres above sea level. Because of a lack of rivers and lakes Malta can be very dry and most of the drinking water comes from desalination - this is when sea water is turned into drinking water. The country's official languages are Maltese and English. 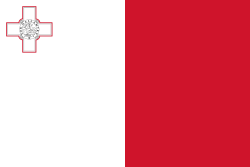 Italian was an official language of Malta until the 1930s, and is widely spoken as a second or third language. Native Maltese people make up the majority of the island. However there are minorities, the largest of which are British people, many of whom retired to Malta. Primary schooling has been required since 1946, and secondary education became required in 1971 up to the age of sixteen. Education is required between the ages of 5 and 16 years. While the state provides education free of charge, the Church and the private sector run a number of schools in Malta and Gozo, such as St. Aloysius' College in Birkirkara. Most of the teachers' salary in Church schools is paid by the state. Malta is a very religious country and over 98% of the country's population claim to be Catholic Christians. There are 360 churches in Malta which is one for every 1000 people. Historically there were also many Jews but nowadays only small numbers remains. Because of recent immigration from nearby African countries there is a growing Muslim population. Over 1.2 million people visit Malta every year for holidays - more than twice the population of the islands. The historic capital city is popular for its ancient churches and other buildings. Beach resorts and holiday areas can be found along the coast of the three main islands. In recent years religious tourism and medical tourism (where people travel for dental and medical operations) have become more popular especially as EU citizens no longer need visas to visit, live or work in Malta. Another reason Malta is so popular with tourists is because the vast majority of the island speak English, Italian and Maltese which makes it easier for many tourists who feel comfortable in places where they can communicate more easily. The city of Valletta, Hal Saflieni Hypogeum - a Greek structure from 3000 BCE and Megalithic Temples of Malta are UNESCO World Heritage Sites which can be found in Malta. The Megalithic Temples of Malta are the oldest free-standing structures in the world and date to around 5000 BCE. These structures can be found across 6 different sites on Malta.